This blue plaid shirt does up with snaps. It has a broad plaid that is actually really hard to see in most lighting, making the shirt sometimes appear to be solid blue. 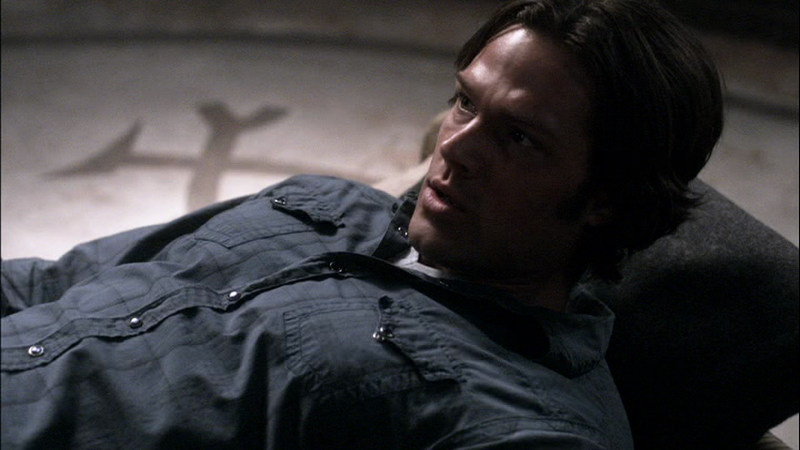 Like many of Sam’s shirts, it’s cut in a western-style and had snaps not buttons. Sam wears it in Everybody Loves A Clown (2x02), for the entire time he is at the circus. In No Exit (2x06), Sam is wears it for the entirety of his time in Philadelphia. He is not wearing in on the drive back to the Roadhouse at the end of the episode. 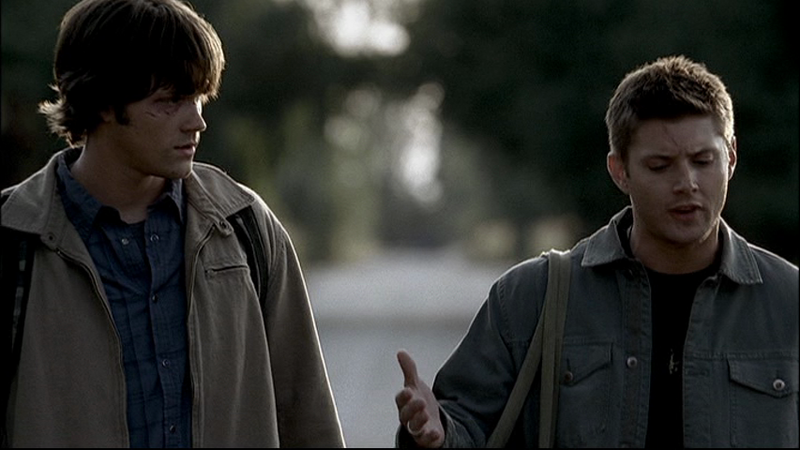 In Playthings (2x11), Sam puts it on after the worst of his hangover is over and he and Dean go try to speak to Grandma Rose. He leaves it on until after he rescues the little girl from the pool and they find Rose dead – then he understandably changes into something a little less wet. In Folsom Prison Blues (2x19), Sam is arrested wearing this shirt at the beginning of the episode. They allow him to wear it until he arrives at the prison, but then he has to switch to a prison uniform. In Time Is On My Side (3x15), Sam wears it from when they start getting ready to hunt Doc Benton until the end of the episode. In The Rapture (4x20), Sam wears it after Jimmy escapes until the end of the episode when he is locked in the panic room; which means Sam also wears it for the entirety of both When the Levee Breaks (4x21) and Lucifer Rising (4x22). In Sympathy For The Devil (5x01), even when he’s re-united with his belongings, Sam still wears this shirt for the entire episode. In Family Matters (6x07), Sam wears this shirt when they travel to the Campbell compound to check on the state of Samuel’s soul. He keeps it on for the rest of the episode. In Meet the New Boss (7x01), Sam is wearing this shirt when he is reading at Bobby’s kitchen table and hallucinates that he is being hung from the ceiling by a thick chain. He wears it until after they summon Crowley to conspire. In How To Win Friends and Influence Monsters (7x09), Sam wears this shirt at the beginning of the episode as they arrive at the abandoned house and he goes over the case with Bobby. In Captives (9x14), Sam wears this shirt at the end of the episode when they return to the Bunker with Mrs. Tran and then say goodbye to Kevin. 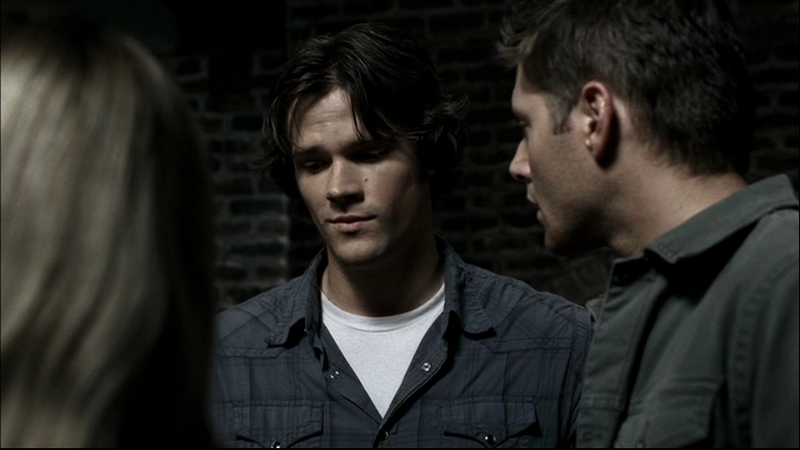 In Paint It Black (10x16), this MIGHT be the shirt that Sam is wearing in the car on the way to the case. FATE: Presumably confiscated by the prison authorities in Folsom Prison Blues (2x19), he somehow recovers the shirt (perhaps Deacon mails them their clothes later).